His Excellency the U.S. Ambassador to India Mr. Richard R. Verma visited Kalinga Institute of Social Sciences (KISS) on January 22, 2016 and interacted with 25,000 tribal students of the institute. “It is amazing to see 25,000 children at one place. I have visited more than 70 countries, but I have never seen an institute like KISS”, he said in his address to the students. “My parents and grandparents were from India. My father and my mother were teacher. My grandmother was also a teacher. However, my grandfather did not get scope for education”, Ambassador Verma said, emphasizing his Indian roots. Condition of India at that time was bad, but now the country is emerging as a global power, he observed. “I am standing before you as US Ambassador due to my parent’s hard work and the education that I received”, he stated. Education is the most important factor that opens floodgates of opportunities, he said, while telling the students to be proud of the education they are getting at KISS. Many children of the world do not have opportunity for education, he said, adding that Founder of KIIT & KISS, Dr. Achyuta Samanta has been doing a tremendous work for education through the two institutes, he added. “You are the future mirror of India as well as the world. 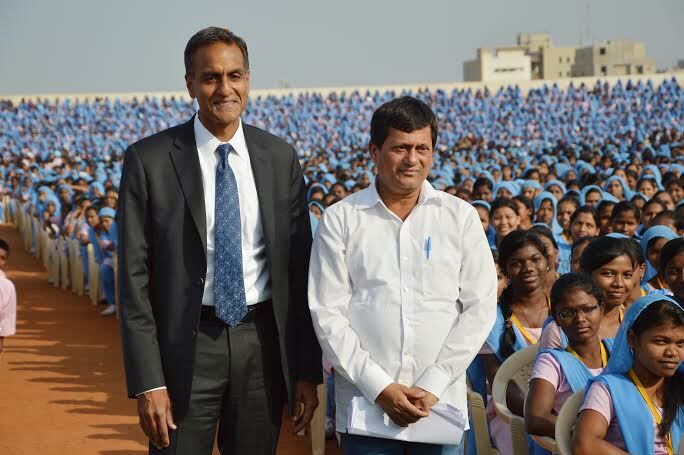 I am looking forward to see our young Indians to lead the country and world”, he told the students. Ambassador Verma also inaugurated the English Access Micro-scholarship Program of the U.S. Government and distributed certificates to 16 students from the new Access class. In his welcome address, Dr. Samanta informed that two U.S. Ambassador to India have visited KISS before Ambassador Verma. However, visit of Ambassador Verma is very special because of his Indian roots, he added. Among others, officials from U.S. Consulate Hyderabad Mr. Michael Mullins, Consul General; Mr. Gabriel Hons-Olivier, Public Affairs Officer; Mr. Peter McSharry, Political and Economic Officer; Mr. Salil Kader, Cultural Affairs Advisor and Mr. Bradley Horn, Regional English Language Officer, U.S. Embassy, New Delhi accompanied Ambassador Richard R. Verma.